Curious about the natural materials, fabrics, and finishes we use in our products? 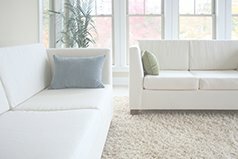 Whether you're considering a new organic mattress or a piece (or two) of organic furniture, these samples will help. Click any image below to order a sample kit or swatch ring. A collection of all our zero-VOC finishes. Natural latex samples and a swatch of our organic mattress casing. Browse each of the organic fabrics we use for our organic sofas and chairs.